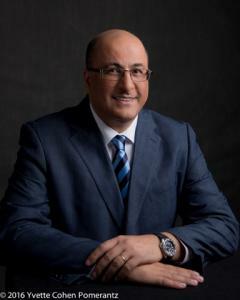 The Maccabi World Union (MWU) Executive Board is proud to announce the appointment of Ambassador Ido Aharoni as the organization’s Global Ambassador. KFAR MACCABIAH, ISRAEL, November 5, 2018 /EINPresswire.com/ -- The Maccabi World Union (MWU) Executive Board is proud to announce the appointment of Ido Aharoni as the organization’s Global Ambassador. Aharoni is a veteran of Israel’s foreign service where he spent his entire career, spanning almost three decades, in the United States culminating with a six-year term as Israel’s consul-general in New York with the rank of Ambassador (2010-2016). In this new lay leadership position Ido Aharoni will assist MWU with its representation in international forums, forge strategic partnership with leading global sports institutions and brands, as well as work to improve the overall positioning of MWU as a global brand. Ido Aharoni, who is best known for his work leading the Brand Israel program, is a well-known branding practitioner and teaches this subject at New York University. “We are very excited that a seasoned diplomat such as Ambassador Aharoni will be joining our ranks and help us spread the good word about the great work MWU is doing globally,” stated Amir Peled, Chairman of the Executive Board of MWU. Eyal Tiberger, the CEO of MWU, added, “I have known Ido for many years. No doubt in my mind that together we will advance MWU on the world stage”. "As an avid sports fan myself, I am honored to have been asked to participate in this great effort. I believe that sport is the ultimate bridge builder between people and cultures," stated Aharoni of his appointment as the organization's Global Ambassador. MWU was formed in 1921 and is considered one of the largest sports organizations in the world, producing every four years the Maccabiah Games in Israel which attract more than 10,000 athletes. MWU that consists of 450,000 members with passion to sports and love for Israel spans over five continents and more than 80 countries. MWU was established during the 12th World Zionist Congress in Czechoslovakia in 1921. It was established to "foster physical education, belief in Jewish heritage and the Jewish nation, and to work actively for the rebuilding of our own country and for the preservation of our people". In 1960, the International Olympic Committee officially recognized the Maccabi World Union as an "Organization of Olympic Standing".